MICHELLE: There are a lot of new volumes for series I haven’t started yet this week, which makes me feel kind of weird about picking them. 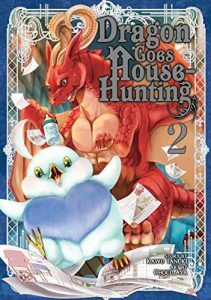 Still, there’s no way I’ll ever resist a series called Dragon Goes House-Hunting, so I’ll choose the second volume with the certainty that someday I really will read it. SEAN: Same here, so I will pick a 5th volume of Kakafukaka, a digital josei manga whose overall subdued mood and frustrating but fascinating characters I’ve really come to enjoy. ASH: Despite the number of series being released this week, there are actually relatively few that I am actively following (at least at the moment). Inside Mari is one exception to that, however, so that’ll be my pick this time. ANNA: My pick of the week is the stacks of unread manga in my house. Maybe I’ll get caught up on a series or two! MICHELLE: Honestly, that should be my pick every week! MELINDA: I’ve been sick for the past week, so I’ll join the catch-up group this week! I’ve got quite a backlog to get through.